This skillet lemon chicken recipe is a snap to fix and cook. It's perfect for dinner for your family but delicious enough to serve to guests. It is versatile to serve with sides such as hot buttered noodles or rice. Steamed or roasted vegetables will round out your meal, or start with a fresh green salad. You can use any mushrooms for this dish. The typical cultivated mushrooms you see in the grocery store are button or cremini mushrooms. When they mature, they are known as the portobello mushroom. But there are many more varieties and you may find wild mushrooms available at the farmers market in season. You can make this dish with one type of mushroom or a medley of varieties. Just be sure to sauté them long enough so all are softened. While you could use canned mushrooms, you won't get the flavors that develop with cooking fresh mushrooms. Lemon pairs very well with chicken, as you can see in recipes such as chicken piccata with lemon and parsley. 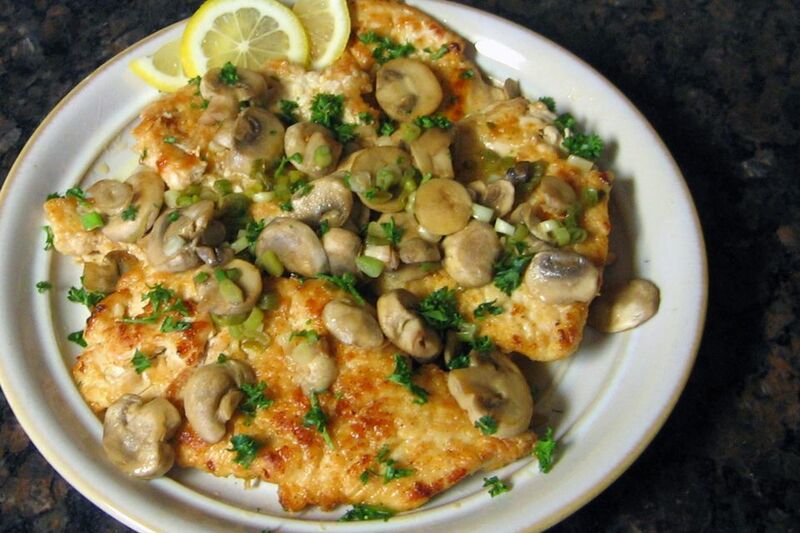 Chicken Marsala is a similar recipe that is made without the lemon. Place the boneless, skinless chicken breast halves between sheets of plastic wrap; gently pound them with a mallet to thin them to an even thickness. In a plastic food storage bag, combine the flour, pepper, garlic powder, and paprika. Add chicken and shake to coat well; shake the excess flour mixture off. Discard the bag and contents after removing the chicken breasts. In a large skillet, heat olive oil and butter over medium heat. Add the chicken breasts and sauté for 3 to 4 minutes per side. Turn the chicken and sprinkle with a little salt. Place the cooked chicken breasts on a platter and cover with them with foil to keep warm. Add the sliced mushrooms to the skillet with a little more butter, if needed. Sauté for 3 minutes, until browned and tender. Add the sliced green onions and sauté 1 minute longer. Add Marsala wine and lemon juice; simmer for 1 minute. Put the chicken back in skillet; simmer for 1 minute longer. Remove the chicken from the skillet and arrange it on a serving platter. Pour the sauce and mushrooms over the chicken and garnish with chopped parsley. Store any leftovers, covered, in the refrigerator. Reheat in the microwave to enjoy for lunch or dinner the next day. You can also slice the cold cooked chicken and add it to a salad. You can use a dry white wine to replace the Marsala wine if that is what you have available. If you prefer to cook without wine, use a little chicken broth or water instead of the wine.